Stratification is a commonly used device for variance reduction in statistical estimation problems. A judicious choice of the strata may lead to substantial reductions in the variance of the estimator. 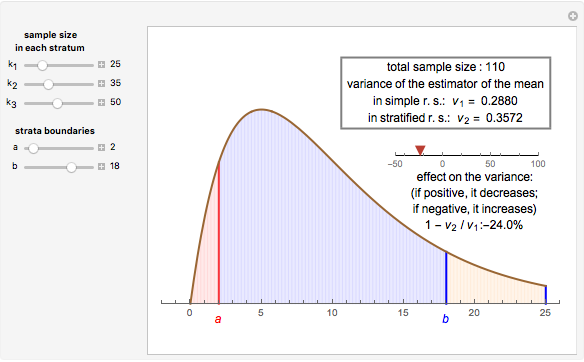 In this Demonstration, the estimation of the mean of a truncated gamma distribution with parameters [2, 5], adequately normalized, is considered. 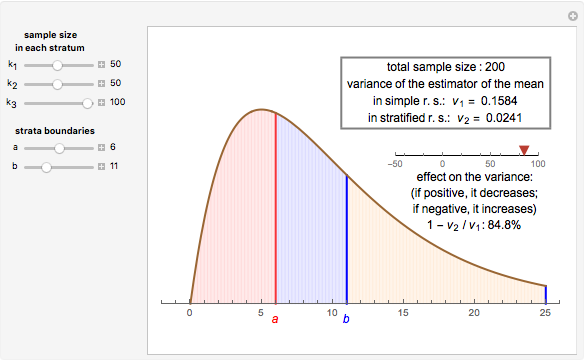 Once the strata limits are established, the variance of the estimator depends also on the sample allocation, that is, the sample size allocated to each stratum. This Demonstration affords a simple way to look at the behavior of the variance as a function of strata definition and sample allocation. 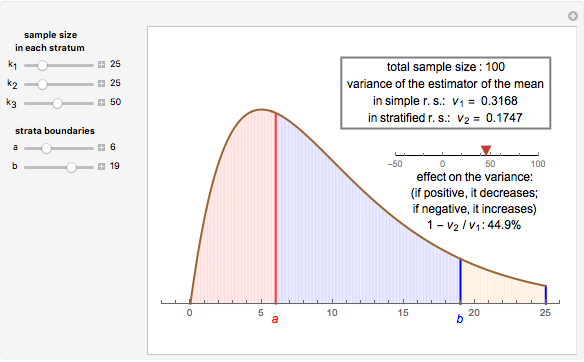 This variance is compared with the variance in simple random sampling (simple r.s. ), that is, the sampling scheme with the same total sample size and no stratification. Moving the sliders for strata definition and sample sizes yields the change in the value of the variance depicted on the scale placed at the right of the distribution plot. Contrary to common belief, an inadequate stratification may lead to variances greater than those obtained in simple random sampling. Tomas Garza "Stratification as a Device for Variance Reduction"